2002 was a vastly better vintage than is generally thought but only on the left bank Cabernet oriented vineyards. Yet this is pretty green. OK a green seam is part of the GPL style. I’m not sure if this is going to be a lean long distance runner or whether it deserves the damning with faint praise that a number of critics (eg Parker) have given it. My money is on this turning out better than expected. It’s dark, in no way extracted and the estate has the pedigree. At the moment leave it. Buy it if you see it priced low (as I did) you can easily pay double or three times as much for younger vintages. Have faith. 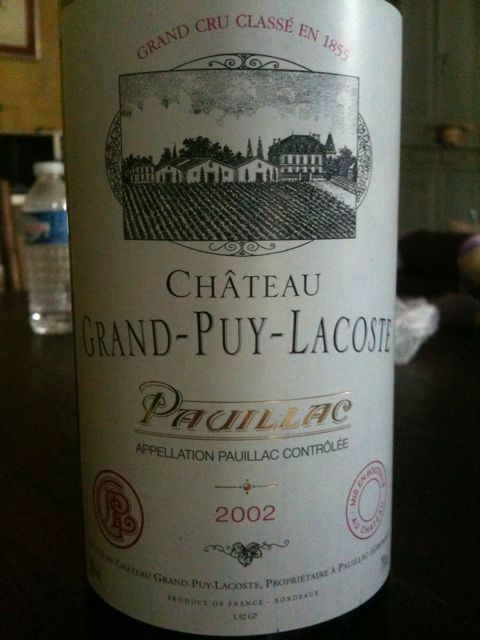 This entry was posted in Bordeaux, France, Wine by ByronSharp. Bookmark the permalink. A year later my opinion is the same. Like many of the left bank cabernet oriented clarets from 2002 it’s looking pretty hard, savoury and green at the moment – not a good time to drink these. Wait 5 years or more.